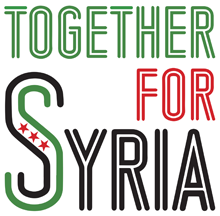 The Syrian people need your support. Having suffered massacres, torture and brutal war, they are now being murdered through starvation. The Assad regime is enforcing starvation sieges on towns and cities across Syria. These sieges are part of the regime's “Kneel or Starve” campaign, ongoing since 2013, aimed at forcing rebellious towns and districts to surrender. Many refuse to do so, knowing the horror that awaits them if the regime reimposes control. So their suffering continues. It does not have to be like this. Those of us in the West, in Europe and America, can pressure our governments to act to break the sieges and protect civilians from starvation. Many of these governments are currently bombing ISIS in Syria. 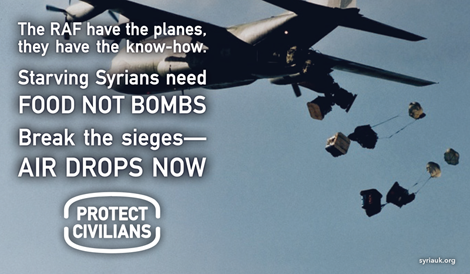 We are calling on the British governments to use its air power to drop food not bombs: To use their planes to break the starvation sieges with food aid, to relieve the suffering of the residents, and to save lives. The international publicity surrounding the siege of Madaya has forced the Assad regime to allow aid in to the town for the first time in sixth months. This shows what public protest and pressure can do. But the aid that has reached Madaya will only last some weeks, and very many more areas are also under siege. 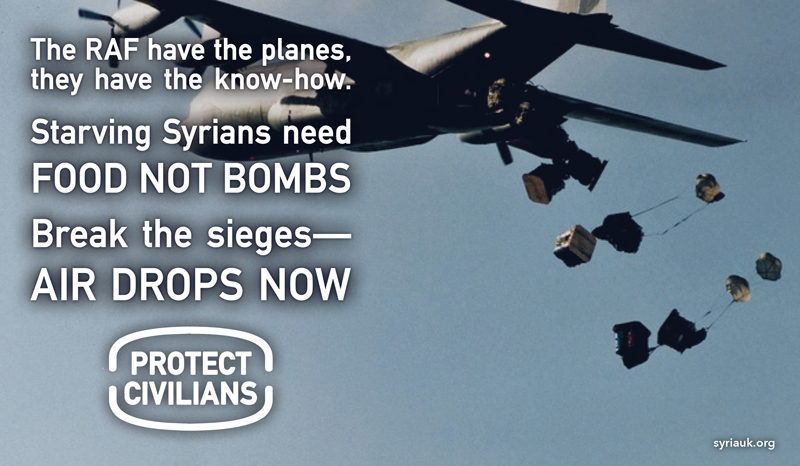 We call on you to support the campaign to break the sieges, support the call for the UK government to airdrop aid to all besieged towns, and defeat the regime's attempts to starve the population into submission. Please sign and circulate the petition and attached graphics, and urge the British government to act to protect civilians. 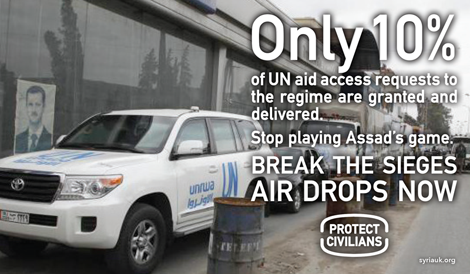 Sign the petition to start aid drops to besieged civilians in Syria. UNHCR report on Madaya after delivering aid. 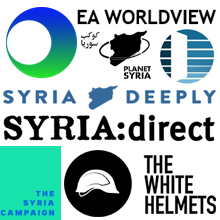 All of our posts on besieged civilians in Syria are here. The US never has and never will do anything good for the common person. They have their own political interests. With US intervention, Syria can only look like Iraq, Afghanistan and Libya. Keep US military out of Syria.